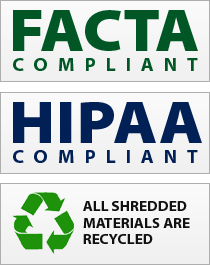 When it comes to Document shredding service, consumers and businesses have endless of choices. Choosing the right company is not as easy as you may think. You need to find a balance between secure shredding service and fair fees. We believe that you are at the right place if you are reading this web page. 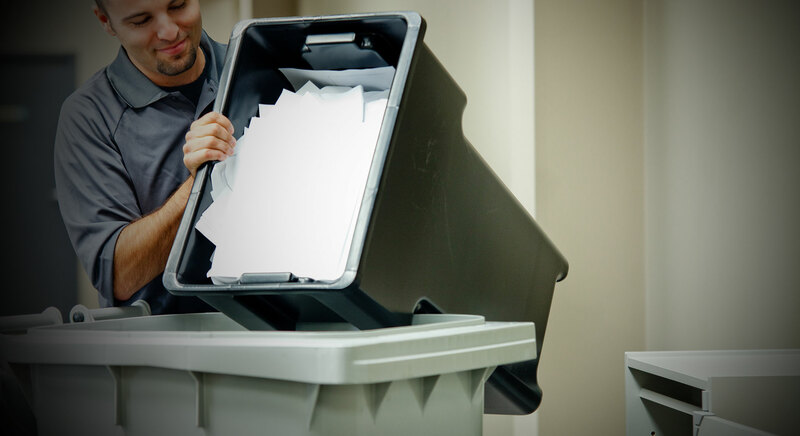 Off-site shredding service is convenient because every customer is unique, and our trained document shredding specialists will offer suggestions as to what shredding service best fits your needs. We offer pick up service for clients who would like to save employee time and money from internal office paper shredding. We also offer a one-time paper shredding service also known as a “purge” service. This service is designed for clients who wish to destroy documents that have accumulated over a period of time. With every service, we provide a certificate of destruction. A certificate of destruction is your legal audit trail that shows an auditor that you are in complete compliance with all State and Federal paper shredding laws. We service Small and Large Size companies and area residents. We offer the most comprehensive options including off-site shredding and on-site shredding, pick-up service and walk-in service. If you have a large volume of material or are looking for the most economical document shredding solution then offsite shredding is the right solution for you. We send our secure truck to your location to collect the material. It is then shredded at our secure facility. At the end of the process you will receive a Notarized Certificate of destruction for your records and compliance needs. By using our plant shredders that are too big to fit in a truck we can provide you with a document destruction program at an exceptional price. In minutes we can turn years worth of documents into little bits for recycling. We come to your location to pick up your material. The material is transported in locked bins and secure trucks. We shred it at our secure facility: 24/7 Security, Locked Facility with limited access. Employees are subject to random drug tests and Cori checked. Upon job completion, you will get a Notarized certificate of destruction in the mail within 24 to 72 Hrs. 100% of your material is recycled. Drop off your documents at our convenient location in Lowell MA and save $$! There are many situations when a MA and NH businesses and area residents may need immediate document destruction “yesterday.” Sometimes, due to high work volume and deadlines, office cleanup may not be managed perfectly or, perhaps a deadline for disposing of documents has to be pushed forward because of a move or an inspection. Whatever the reason, drop off document shredding service is your best and most common sense means to an end. Drop Off Shredding Service meets the needs of homeowners and the self-employed. It has become commonplace to shred your unnecessary bank statements, invoices, utility bills and miscellaneous private information including Electronics and Media. These sensitive documents are often thrown in the garbage or the recycle bin. This is risky, potentially dangerous behavior.